Mens couture from Alexander McQueen demonstrates just how flamboyant high stakes denim for men can become. Embellishment onto a simple monochrome jeans and jacket combo is cool and surprisingly masculine with delicate stitchery onto a heavy weight denim. Dolce Gabbana below is also over embellishing and decorating his "not so classic" jeans and jackets. D&G throw the kitchen sink at their flamboyant garments even for men. They have so much embellishment that to describe it diminishes the look. 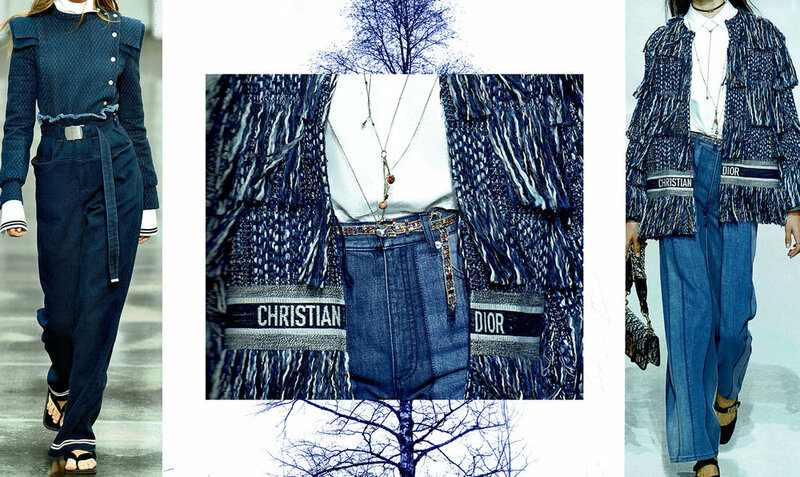 The flamboyant denim creations from Christian Dior below mixes frills with page boy studs and frayed edges and again with masses of indigo and ecru fringing plus bi shade indigo denim. Oversizing the shapes creates a substantial silhouette as a vehicle for this overstated detailing. We have to wind up this flamboyance with the master of the trend himself - Versace. From whose atelier everything is overdone, overworked and overstated. The wearer needs a big personality. Tailored Denim is cool clean and smart. Clever cutting and shaping with little or no washing of the denim lends a casual touch to a high styled garment. Mixing street denim with a brand name. Clever shaping from Marques Almeida with added studding for a harder edge when combined with a bleached out denim begs the question - is it high fashion or street denim? 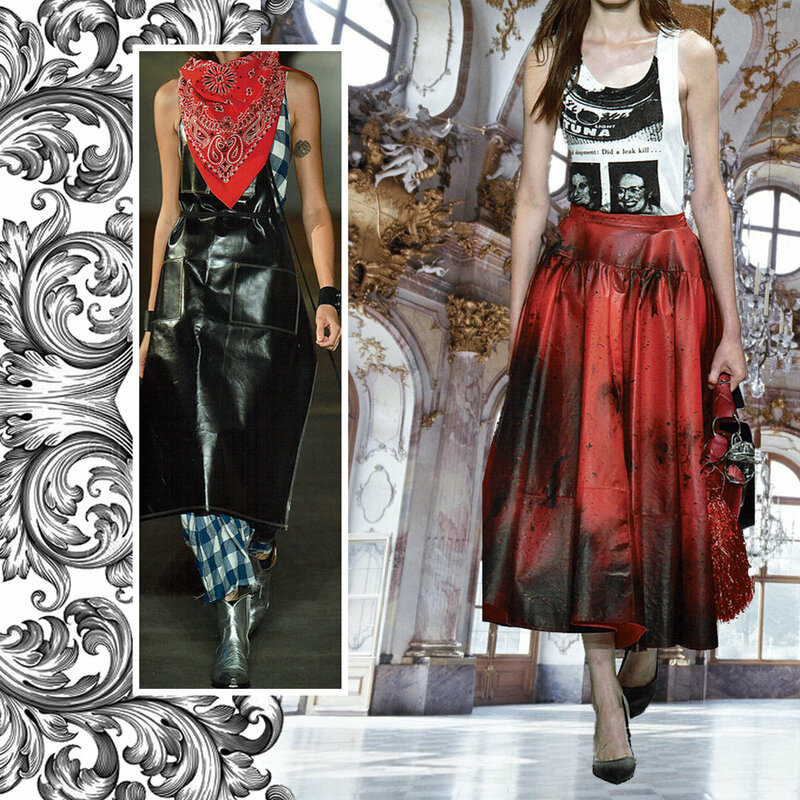 Here we repeat again the amazing Mcqueen's multi seam shaping and multilayered styling. He gathers in the extra fullness with such panache making the shaping of what is a tough fabric into truly glamorous tailored pieces. Dior uses blue denim with flare - cutting an oversized sharp blazer in a combination of indigo shades to restate the difference between this and a standard jacket. Combined with this indigo and ecru cotton fringed skirt is a real must have combo. Whilst Carolina Herrera and Sacai have concentrated on the simplicity of long line super shaped dresses. Full and light weight denims are formed into oversized pant suits from Tibi whilst Nina Ricci again demonstrates her genius for sharp tailoring and top stitching. Glamour jeans have become recognised by their over embellishment. Anna Sui is known for her over-use of embroidery, beading and braiding on what is basically a simple denim jean or jacket. Embroidered story telling makes this shearling trimmed denim jacket from Gucci a covetable piece. Especially when combined with a bold tweed skirt. Super youthful styling but super expensive pricing! Versace takes his glamour and flamboyance to the extreme below. Using basic jeanswear shapes as a vehicle to elevate the idea of denim wear. Western shirt shape with denim shorts. And Jeans topped with constructed denim top. All encrusted and embellished with beading, appliqué and embroidery within an old fashioned seaside theme. Black denim from Versace again has been given the Western Matador treatment with studded decoration and gold thread motifs. Clearly building on a western theme both in accessories as well as decoration. High fashion Luxe Denim is elevated above the simplicity of the daily jean as we know it. Luxe denim may follow original vintage inspiration, remodelling fit and form and adding personalised limited edition detailing. It is the clever cutting, higher design form, embellishment and creativity that commands the high stakes price and desirability. Couture and Ready to Wear brands are highly sought due to their limited editions and the almost rock star status of the Designer. It is encouraging to note the extensive use of simple denim at couture and catwalk levels. Thereby influencing the confection of high street denims. Voluminous beautifully cut Tibi man style pants suits in dark barely washed denim takes blue denim into a formal fashion conversation. Likewise with a formal dress from Fendi in unwashed lightweight denim where the styling details are imaginative and dramatically visible. Flamboyant yet super clean cutting from the atelier of Alexander McQueen. The Atelier has focussed on visible seaming, multilayering and clever shaping bottomed out with kick frills of contrast fabric. This is flamboyant longevity to wear with pride. Oscar de La Renta is showing less flamboyance, instead moves subtly from an original Levi style cut in jacket and skirt with a difference in slits and shaping topped off with paint splashed finish. Stella's signature boiler suit having a nod to its denim origins whilst being simple is flamboyant in colour and gathering detail to contain the volume. Attention to details of seaming and top stitched cording and most importantly the high quality non denim fabric are all signatures of Stella. Mary Kantrantzou has stepped right away from denim in both her use of performance fabric and brilliant colour blocking. The nod to the denims is in the studding and riveting. Her pieces sit alongside denims and jeans adding the sport influence rather than emulating them. Dolce & Gabbana bring their creative and unusual flair to what essentially could be a simple jacket and jeans combo - Nothing is simple from D&G! Chanel is more elegant. Shaping and top stitch seaming forms the embellished denim jacket into the puffed transparent skirt below. 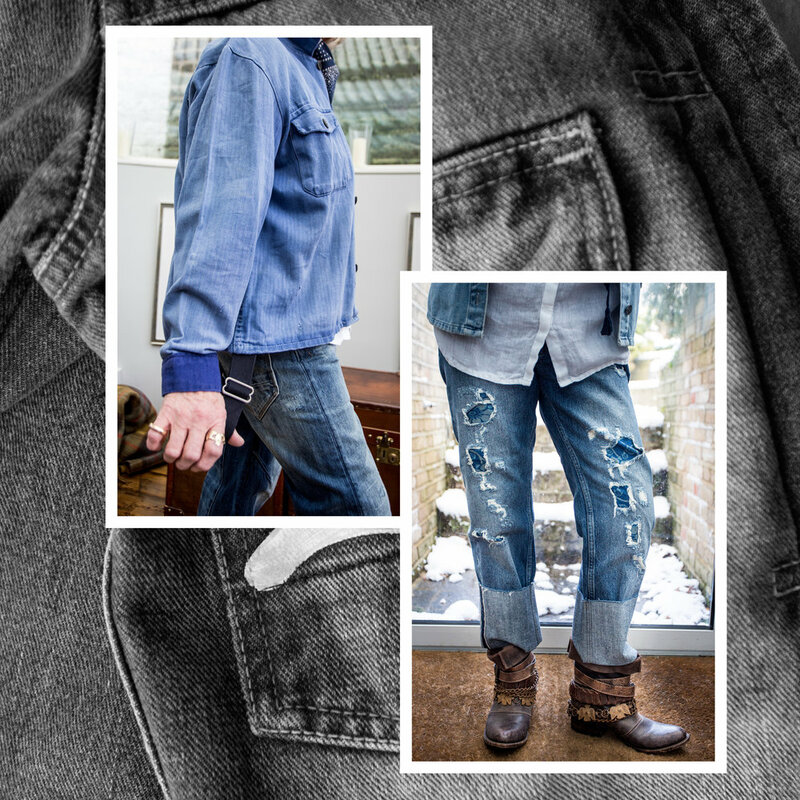 Super creative hand made denim fabric, fashioned from a commercial jacquard fabric hand finished with stitching and fraying from Paul & Joe in what would be originally a work style jacket. Whilst Gucci keeps it more simple with hand drawing onto his sheering trimmed trucker jacket. Various top designers play with denim combining it with sport fabric in simple and not so simple jacket shapes for men. Watanabe shows off her signature jeans patching and shiny coating for her mens collection. Adding cutting edge to simple loose jeans. 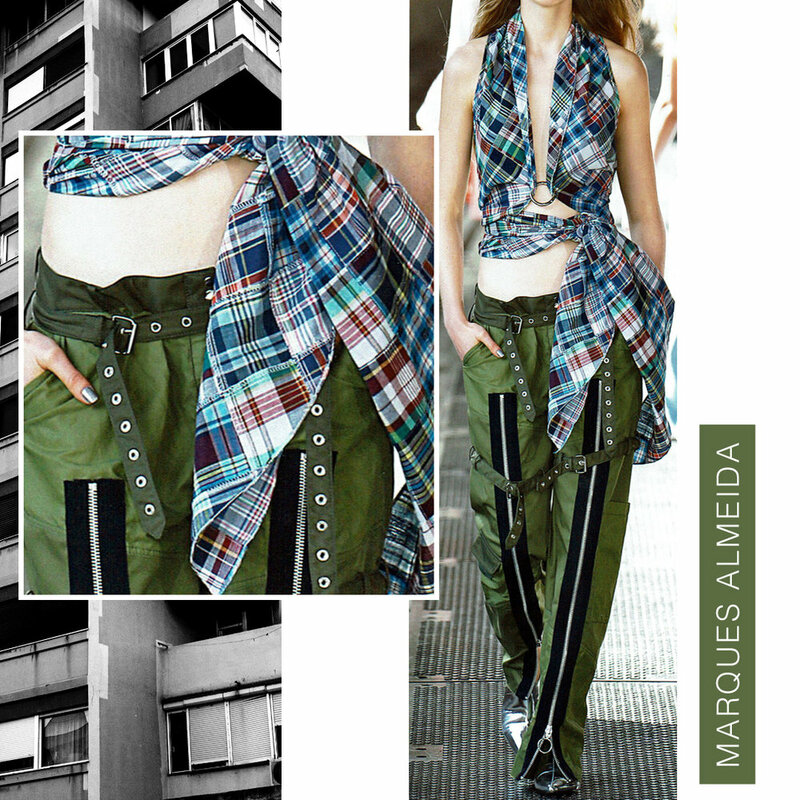 Sport and jeanswear are natural bedfellows demonstrated here very well by the creative use of visible zippers to embellish khaki cargos cinched with a studded military belt from Marques Almeida. Icons of denim fashion have stood the test of time and achieved the tricky balance between being renowned for classic and or vintage jeanswear and fashion denim. One such brand is Replay. After the partnership split with Renzo Rosso of Deisel, Replay became a more young fashion denim brand. This example is of their Mexican influenced mini skirt from their Brazilian franchise - embellished with naif handwork it is almost a work of denim art, the skirt being the vehicle for the creative embroidery. By contrast another denim fashion brand - Energie specialises in different cutting and fabric combos. It is a men's brand, this again shows my preference for mens jeans. In this case the extreme high waist or extreme dropped crotch, whichever works for you! Cleverly combines tweed at the front and coated denim at the back with leather detailing and accessories. MiH big cuff Phoebe jeans are creatively enhanced by the ripping and Shibori patching. And to note that the Phoebe jeans from MiH always use red selvedge authentic denims. Although my stated preference is for men's denim the exception is with MiH as they are the only girls brand that stays true to its roots and heritage of being an iconic 70's brand. Using only the best ringspun and Japanese denim and concentrating on the fit that works best for the shape. What was once a vintage jacket with sleeves has with careful ripping and destruction, become a fashion gilet. 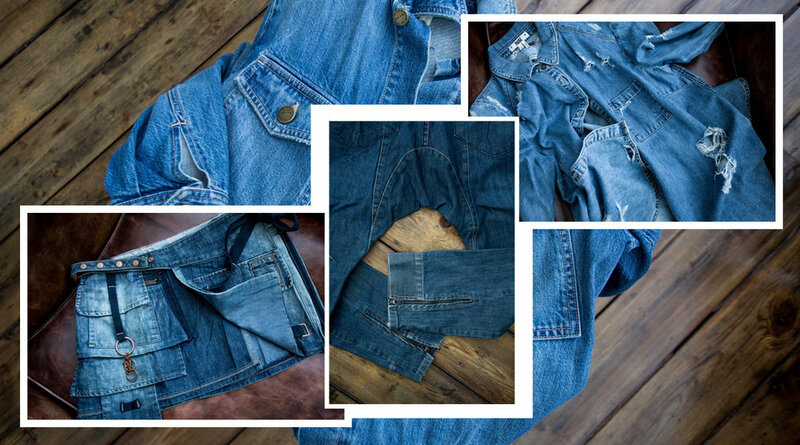 Fashion denim from MiH is exploring and promoting original denim design from the 70's. Their Golborne road project showcased items from Bay Garnett from her 70's vintage edit. Here is a bleached out and studded hippie jacket which would not have looked out of place in the original Kensington Market, so evoking memories of that place and time. And of the same vintage i have the indigo chunky knit from Geo Trowark who were one of the first knitwear companies to use indigo dyed yarn outside of the denim business. As indigo is such a quixotic dye it is very hard to work with and make fast. The answer is in the case of chunky knits - don't wash it. My one and main indulgence was and still is, the patched and pieced big jean from Junya Watanabe of Come Des Garconnes. Super creative and almost ugly in its beauty. A piece to keep forever. Workstyle is integral with vintage given that the fist jeans were worn by both railroad workers and cowboys - both for heavy duty work. The violet blue worker jacket is a real vintage item that i still wear when the mood takes me. The flapped pockets and collarless style have a charm enhanced by the oddly restored cuffs- one contrast blue and the other missing and frayed. My Kapital work shirt - not vintage but it is from the stable of super Japanese style. Extreme dark crisp denim with white top stitching - a truly classic piece. Works with non denim clothing to add denim to everything. My G Star work style jeans whilst not old are a real favourite. The shape is great enhanced by braces attached by original button carriers. Additionally the denim fabric works in harmony with the renowned G Star washing. In combo with the AG little work jacket in a new indigo dobby basket weave the two make a real statement. This jacket has 3 small flap pockets with the 4th being "blind". Here is another item that works just as well with non denim clothing - avoiding the double denim look. Almost military style worker jacket with patch and flapped pockets, epaulettes and super practical side pockets. Heavy wear laundry treatment makes it soft and even more desirable. There is no shame in loving a contemporary piece of "vintage workwear". This time from Current Elliott. Not a brand usually associated with the best of vintage but sometimes they can surprise. Diesel - an old favourite in brand terms and for specific items. All my Diesel jeans are men's. They demonstrate such attention to detail in fabric, cut and laundry they cannot be overlooked by a denim head. These are the most comfy and flattering baggy jeans i own. Dropped crotch, perfect styling and superbly creative washing. The look is old workwear but the reality is contemporary jeans style. Vintage is and has been the driver for denim fabric and jeans ever since the middle of last century. It took a long time for denim jeans to break free from the original work ethic garments to become something more stylish. However, it was and is the fabric that earned the name vintage in the beginning combined with the accessory detailing. Since then all jeans brands have emulated the "vintage " look by replicating the old shade and fabric character as well as the garment details. Some more renowned than others. The simplest way of emulation is of course in the laundry - replicating the worn out appearance with complex laundry techniques. PRPS jeans here demonstrate their successful attempts at not only washing their jeans in a most authentic way but also using fabric from Japan. The denim in the early incarnation of the brand was woven in Japan from cotton dyed with natural indigo dyes. Difficult to find and difficult to process. Natural indigo's adherence to the cotton as host is not permanent so the wash down became easy to replicate the vintage appeal. The first fabric was an amazing natural cross hatch heavy weight denim for men which as it washed down became better and better. The indigo lifting off the reveal the old style construction. This Old Japanese kimono re-worked demonstrates the combo of fragile indigo striped cotton and denim gauze. This item is almost impossible to wear being too fragile. But i occasionally succumb to temptation however, its better to hang as display. Still in Japan the Evisu jeans brand has become iconic. Less popular here in Europe than in Asia. I love the tongue in cheek take off of the Levi name and logo. After ( i believe) unsuccessful court cases it thankfully still exists. Super creative yet staying true to the vintage ethic both denim and accessories in the Evisu collection are vintage replicas whilst the shape is more modern to fit what our bodies and lifestyles have become. Levi Capital E items both jacket and jeans seen here, can still be found if you are lucky enough but at a seriously high price. They are now collectors items. So when you wear them don't leave them at the coat check. 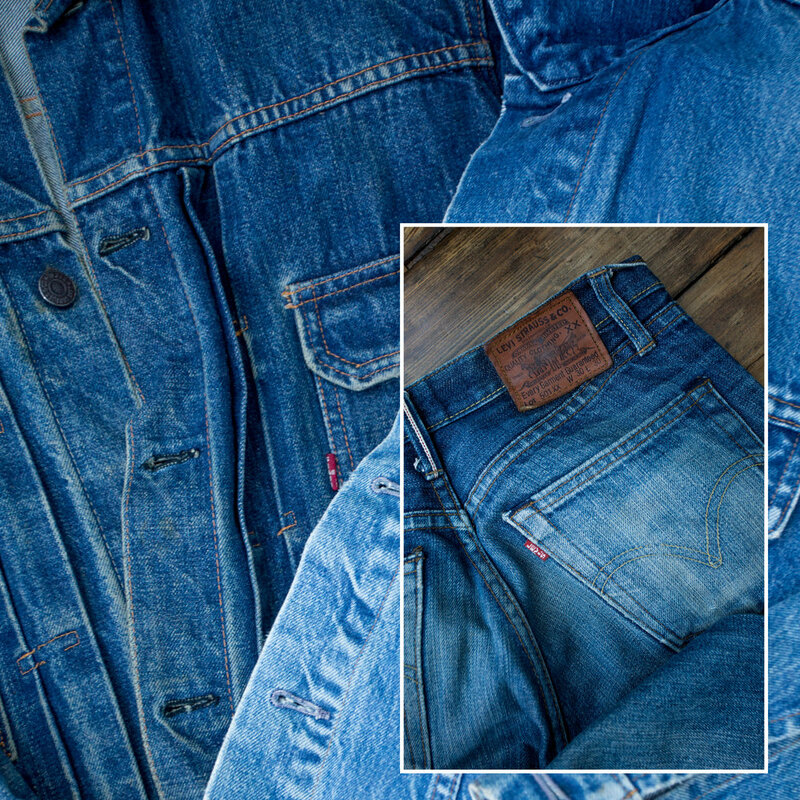 The iconic details is what we love the garment for: front tucking; Capital E on the tag; ring ring old yarn denim; seam puckering and mottled denim surface; red selvedge seams and pocket details. And of course still being able to wear a pair of jeans or jacket that is maybe 100 years old! The natural worn in worn out effects in the Cap E jean makes them especially lovely to wear. Even if the wear creases and rips are in the shape of the previous owner! You can see here the superb old denim fabric, slightly crinkling with age and constant washing and seam pucker details with the front tucking that make such a garment a true icon. My Fiorucci skirt is a really old favourite. 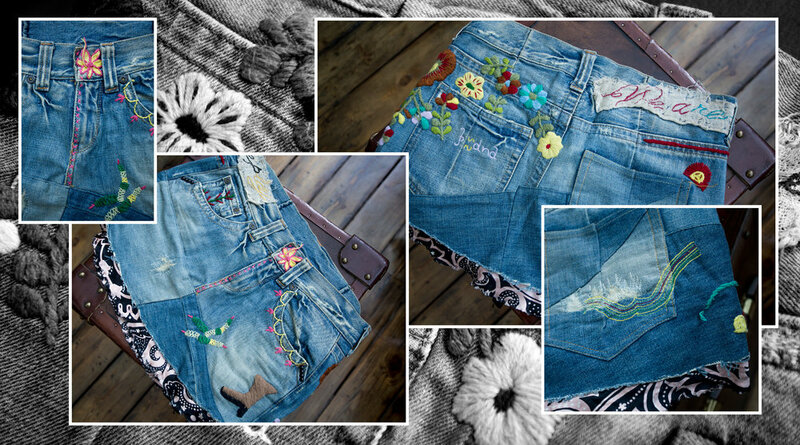 Made from even older distressed and recycled denim panels, revived with plastic and ceramic craft beading. The piecing and patching of pre-worn jeans pieces helps to create the romance enhancing its desirability. Made in the 1960's yet it is just as relevant today. Re-worked vintage denim jacket. Creative licence has been taken in re-working such and old piece. Even though the appliqué and embroidery are of now as is the sleeve fringing the result is a grand replica of western decorated denims. And it fits!